There is some math involved in daniel's Geochronology paper and I wanted to see for myself if it does indeed check out. In the following I will present my results. But before doing that, there are some points I want to go through. Second, my calculations were done with decimal digits to the hundredth, always rounded up to the next ordinal number. This still leaves a margin of error of 0-4 days but saves the tedious read of four digits after the decimal point. So for example the end date Dec 21st, 2012 would be 2011.98 (=355/365) and the alternative end date Dec 23rd, 2012 would also be 2011.98 (=357/365). Third, I calculated with 365.25 days per year (=Julian Calendar) and forgot that our year actually has 365.2425 days on average (=Gregorian Calendar). I'm too lazy to change all of my results now, especially since a deviation of a single month or less is not really relevant in the greater picture of several thousand years. And it is not a deviation per se, just a different calendar system. You can always just convert any given date into its Gregorian equivalent. There are generators for that. Fourth, and this is going to be a long one, I wanted to know where the date 3114 BCE stems from which is considered to be the start of the Long Count. It seems like everybody on the internet is regurgitating it but nobody knows jack on how it came to be. 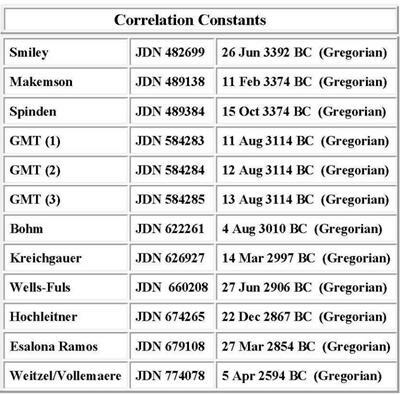 So here is what I found: There are a number of different correlation constants that have been calculated over the years (see chart below), the most commonly accepted being the Goodman-Martinez-Thompson correlation (GMT). The two most widely accepted correlations are 584285 and 584283. These numbers are “correlation constants” that express the base date of the Maya calendar as its Julian Day Number. The system of assigning a Julian Day Number to every day that has elapsed since January 1, 4713 bce, is used by astronomers to record celestial events.3 Thus the Maya base date of 13.0.0.0.0 4 Ajaw 8 Kumk’u is Julian Day Number 584285 in one of the popular correlations—that is, it fell 584,285 days after January 1, 4713. As we shall see, it is not necessary to understand or even use Julian Day Numbers in the correlation, but it is customary. Thompson (1927, 1935, 1950) arrived at 584285 by means of a line of reasoning initiated by Goodman (1905) and revived by Martínez Hernández (1926). This begins with a proposition derived from Colonial-era Maya chronicles and Diego de Landa’s Relación de las cosas de Yucatán, that the Maya date 11.16.0.0.0 13 Ajaw 7 Xul fell in the year 1539 ce. Added to this was the fact that Landa had recorded that 12 K’an 1 Pop (New Year’s Day in the Colonial Maya calendar) coincided with July 16 in his own, with that date apparently falling in 1553. Since 13 Ajaw 7 Xul and 12 K’an 1 Pop were deemed “impossible” dates in the Classic-period Maya calendar, Thompson (1935) began by assuming that at some point after the Classic there had been a “break of a day” and that the Landa date expressed in the Classic system would be 12 K’an 2 Pop. We will return to this point later. By following the regular pattern of the Maya Calendar Round and counting the days between the “corrected” 11.16.0.0.0 13 Ajaw 8 Xul and the subsequent 12 K’an 2 Pop, one arrives at a Long Count date of 11.16.13.16.4 (the Long Count had fallen out of use, but like Thompson we retain it for calculation purposes). Accounting for the “break of a day” brought Thompson to 584285. 2 On the basis of Colonial-era ethnohistorical documents, Bricker and Bricker (2011:79-87) make a compelling case for its correctness. 3 Because astronomers employ a year “zero,” the base date is also written as January 1, -4712. Note that the Julian Day Number system of astronomical reckoning is not to be confused with the Julian calendar, which preceded the Gregorian calendar that we currently use. The pdf has 14 pages of which only the first two are relevant for this post, with the most relevant parts quoted above. The next 12 pages discuss the 1-or-2-days-deviation but that shall not be the issue here, so let's just take those blue numbers above and see if we can get to the often reported year 3114 BCE. Note: Romans didn't know 0, so their calendar goes back from 1 CE to 1 BCE in only one year, not in two. The astronomical calculation includes zero, so Year 0 (astronomical) is 1 BCE (historical). Looking at my spreadsheet, one Baktun is 144,000 days, so with 13 Baktuns (remember 13 is an end date) that makes 1,872,000 days in total. Divide that by 365.25 and you get 5125.26 years. More accurately 2011.94182 which is Dec 10th, 2012 (Julian) and Dec 23rd, 2012 (Gregorian), at least that's what I calculated when using the Julian Day Number 584285 as a premise. [...] only 360 days in a year at this time, for the 5-day month of Uayeb was not added until [...] the end of the 6th Baktun. 21 The civil calendar, originally 360 days. That's 2215.39 + 800 + 2759.76 = 5775.15 years in total. Note: You never round down when dealing with years. You always round up to the next ordinal number, no matter if CE or BCE. Generally speaking, this means that not taking decimals (or rather months and days) into account can give you a margin of error up to +/-1 year, depending if it is CE or BCE. If dates derived from other dates, the margin of error can increase, respectively. That's probably one of the reasons why it is common practice to use the Julian Day Number system as reference. Geochronology, p. 5 wrote: And we can adjust the number of years using Bob’s calendar information. Shorter years early on mean more of them, so the calculated start of the Mayan Long Count was not 3113 BCE, but a bit further back… some 5773 years ago: 3761 BCE. Anyone familiar with the Christian Bible or the Hebrew calendar may recognize that year: the year Adam and Eve were created. A perfect match to the Mayan start of the human world. Geochronology, p. 5 wrote: Hebrew accounts say the Great Flood occurred 1656 years after Adam. Converting that to a Long Count with the corrected calendar puts us near 2.19.16.0.0, which is about 6 years short of the end of the 3rd Baktun, the date of the Mayan flood. So the difference is actually only 2.10 years! Geochronology, p. 5 wrote: The adjusted date for the Hebrew Exodus from Egypt is about 1550 BC [...] The end of the 4th Baktun was 1548 BCE. That's also the date of the 1st switch from 260 days to 360 days, cf. daniel's first quote above. Geochronology, p. 16 wrote: We already know the correlation is off by approximately 10:1, we can estimate that the 1st destruction of Atlantis was no more than 5000 BCE, and the 2nd no more than 2800 BCE, based on Cayce’s information. [...] So if we take the pre-749 BC years and adjust, (5000-749) x 260 / 365 = 3026 years past 749 BC, making the 5000 BCE date on our corrected calendar to be around 3775 BCE. And right there, at 3761 BCE, we have the start of the Mayan and Hebrew calendars, defining the creation of man. Here is where my calculation differs. First off, I want to note that the calculation (in red) does not include the leap years but the result does, so maybe daniel omitted it for better reading or just forgot about it. No big deal since the result is correct. What is a big deal, however, is the use of 260 and 365 in the wrong order. Remember his second quote above: Shorter years early on mean more of them. In this case, more than 4251 years (=5000-749). But 3026 is not more, it is less! So it should be (5000-749)*365.25/260 = 5971.84 years. But that's not all. Looking at daniel's calculation you would think that in the past 5000 years there was only one switch from 260 d/y straight to the 365.25 d/y. Not the case, so let's include both switches: 800*365.25/360 = 811.67 years and (5000-800-749)*365.25/260 = 4848.00 years. Geochronology, p. 16 wrote: If we apply the same logic to the 2800 BCE date, we end up at 2209 BCE, corrected calendar, with the Biblical Flood sitting at 2105 BCE, a very close match. I did some minor fixing and made some formal changes to make it an easier read. And I want to say that although the Atlantis correlation based on Cayce's information turned out to be incorrect, it is still a major breakthrough to have actually found valid correlations between the Mayan and Hebrew dates - which adds credibility to both of them! To be more precise it would be a period of 5775.15 years with a deviation of only 3.43 years, in the other two cases even less! And just in case you don't see it, let me point it out: This is a deviation of less than 0.1%. Or in other words a congruence of over 99.9%!! 1) This calculation is based on the assumption that both expansion events coincided with an end of a Baktun (to the day! ), however unlikely that may be, requiring the old gods – due to their development of calendars this precise – to have either somehow foreseen both of them or, alternatively, to have somehow triggered both of them (on the dot!). It is highly unlikely that this would happen just by chance, naturally, without any foreknowledge or outside influence. 2) The decimal in 2215.39 years indicates a fractional year. But in consideration of my previous point the last year of a cycle must also be a finished one. However, there is no way to tell whether the 260 days per year were actually ~260.045 d/y or ~259.928 d/y or whatever. My calculation is based on the median, since it includes the decimal. This, of course, creates a margin of error, though it can't be determined to which extent. Probably up to +/- a lower single digit year. Mathematically, the leeway would be between 259.5 and 260.49 average days per year, making this margin +/-4 years. But the old gods wouldn't have this mathematical system. In any case, they were probably more precise in their measuring and calculating than missing half a day per year. So a margin of max. +/-2 years would be a better guess. This leaves us with the options of ~259.81, ~259.93, ~260.05, ~260.16 or ~260.28 days per year in order to get the respective results of 2213, 2214, 2215, 2216 or 2217 years for equating the first 4 Baktuns. However, this would throw off the seasons several times over! That is, if the Mayans were not stationed near the equator. Looking at the last 7 Baktuns with yet another decimal, there could be another explanation. Perhaps the events were not foreseen to the exact day or, if triggered, then not at precisely the end of the Baktun, but some time before - and the old calendars were just kept to the very end of the given Baktun before a new system was introduced. You referenced Mauro Biglino's work in a footnote on the first page of the paper but I haven't gotten around to read it, will definitely do though. Perhaps after I have some basic knowledge of Hebrew, although I'd be learning modern Hebrew. I've read the book and it's good, but while Flavius Josephus may have been used as the Jesus template, I think he was using the template from folklore and mythology before that, i'll send you a book I started on about it, could very well be that an early pagan/druid or even LM character was the original source, which Josephus and the Romans used for their own ends, then re-used again with the Jesus story. Whether this was to control Jews as Biglino states I'm not so sure... we know how much they have been controlling this reality they have manufactured for us since biblical times, hiding themselves and re-writing history for many despicable gains. I think it's more likely that the original mythology and folklore figure (see King Arthur, Merlin, Morgan Le Fey and co.) has had their story re-told in order to cover the true events of pre-manufactured-history of which mythology and folklore tell more truthfully. The biblical period just got very interesting for me as I keep finding confirmation and clues telling me that Comyns Beaumont was onto something. It's also tying in with another local hill fort research project i'm doing and i've now got all 6 of his books which i've started reading. I had read a fair bit of Britain the Key to World History on PDF but having the whole collection now is a major bonus, along with Comyns later work which, surprise surprise, is about Liz 1, Bacon and Dee! daniel wrote: I haven't yet done the correlation work between the attempt to eliminate the Knights Templar and the expansion event, which both occurred in the 14th century, so there might be a correlation there. (Friday, October 13, 1307.) But that was a definite shift in the power structure of this world. Only a few more dozen books to read first! At least 6 good ones are now physical books. Outstanding work animus, you've done some great calculations, well written, easy to get your head around and it's great to see the correlation. This is of course very helpful to my chronology research so i'll speak to you more about that soon and see if we can set some key dates in line to provide a framework to work from. You wouldn't think that English isn't your first language! So are you saying that the calculations changed, related to the change in size and orbit/rotation of the planet following impact and expansion, at the end of each baktun? I reckon it's more likely that the entire calendar was amended or recreated post-expansion in order to fit new calculations. I agree with this, that the (roughly) 1317 middle ages expansion was a smaller one but all the evidence i've collected so far points to the great bombardment at this time, with a meteor/comet fragment impact starting the little ice age and years of global catastrophes, earthquakes, drought, floods, storms, then add in the black death which was clearly the use of biological agents during this war. Maps also show the continent layout similar to now but on a smaller oblate spheroid pre-expansion. In this lifetime challenging Catholicism seems to be top of my list of things to get done... I keep on running into them. It's the BEST control system. Terrify people, don't let them think about what it is they're even scared of, and promise them Jesus will help them because they can't trust themselves and certainly can't take responsibility for their own actions which must obviously be base and dirty for so they are told. it's such a magnificent distortion of the system they stole from the Druids, who'd been managing comet-related PTSD-type mass trauma for nigh on 2000 years. I'll also need to finish The Riddle of the Earth, Comyns book 1, then move onto book 2 The Mysterious Comet, to see what else I can uncover as it looks like meteor impacts tend to happen at an angle near the poles which would tie in with both his southern hemisphere impact/one large supercontinent break up, and the 14th century north pole impact. I think it's more likely that the original mythology and folklore figure (see King Arthur, Merlin, Morgan Le Fey and co.) has had their story re-told in order to cover the true events of pre-manufactured-history of which mythology and folklore tell more truthfully. Since you have thrown in those three names, what material do you recommend, specifically? This is of course very helpful to my chronology research so i'll speak to you more about that soon and see if we can set some key dates in line to provide a framework to work from. You wouldn't think that English isn't your first language! You know... up to 12th grade, I had had six different English teachers, none of whom had succeeded in teaching me English, properly. The sixth one handed me a corrected exam with the words "animus, your exam was the worst of the entire class! You should really do something about it." And I did. I read the entire series of English books from 5th to 10th grade (6 books in total) in only two weeks. I copied all the vocabulary by hand, which accumulated to roughly 5,000 words--and I learned every single one of them. After those two weeks I knew all the vocabulary inside out with an error rate of max. 2%. It was the very first time in my life that I had actually studied something, properly. And I did it all by myself--and it was fun! I learned more English in those two weeks than I did in all the years prior to that. It made me realize how a better school system could save children a LOT of time and unnecessary stress! I even had a seventh English teacher in 13th grade and I accidentally wrote my last exam into my old 12th grade book. Now there is an E+ directly followed by an A- in my book. Makes for great motivation when I tutor kids. What I usually don't tell them is my converse experience in math. I dropped from an A- to an F, all within one year when I was in 11th grade. (When we changed the class room, I had some new friends sitting next to me and decided to have more fun during the lessons. ) And it gets better. There was one time where the grades from students of all years were submitted for nationwide comparison (anonymously). And as it so happened and I only later found out, of all the math exams that I have written up to that date, my F was the one being submitted for nationwide comparison. My personal contribution to Germany's statistics--flipping off the entire country. So are you saying that the calculations changed, related to the change in size and orbit/rotation of the planet following impact and expansion, at the end of each baktun? I am not saying anything. I only stated objectively - within the paradigm of dirigible moons - what a calculation with Bob's input would infer. And just so there is no misunderstanding, a change in the calculation only occurs after the 4th and the 6th Baktun. Whether that, too, was the actual time of expansion events, is a question we cannot answer for certain. Perhaps a more thorough research into the Mayan Calendars would reveal something. There is a chance that researchers have overlooked (or concealed) valuable information due to the assumption of the Tzolkin being a corn calendar. The Hebrew Chronology should also be looked at. As I understand, the date 3761 BCE was derived through some chronological backtracking done in the Seder Olam Rabbah. Ever since then the date is a given and not to be tampered with among Jews. So naturally there is hardly any material on its calculation. I don't frequent Hebrew websites but based on what the English ones spew, it is save to say that - again - everybody on the Internet is regurgitating the date but nobody knows jack on how it came to be! But before I continue any of this I want to catch up on some literature first. I was never a religious person and would very much like to have a historical basis that I can work with. I have collected a few works last week (Enūma eliš, Bible, Qur'an, Book of Jubilee, Epic of Gilgamesh, Book of Enoch). This should suffice for a workable basis. However, this is not a high priority for me right now, so don't hold your breath for a next update any time soon. I have also collected LaVey's satanic bible and some of Robert A. Johnson's books to see what this whole ego and shadow stuff is all about. I reckon it's more likely that the entire calendar was amended or recreated post-expansion in order to fit new calculations. I had the same thought but it required an explanation to why the calendars would just happen to end exactly on the last day of a Baktun?! (This is how the calculation had to be done.) It is too much of a coincidence. And it must have happened twice! If the expansion events just occurred without any influence or foreknowledge whatsoever, then it would have been far more likely to happen on any other of the 143.999 days instead of the last one. But if the calendars were changed as a result of unforeseen and untriggered mid-Baktun expansion events and were just kept counting to the very last day for the sake of it, then the above calculation does not reflect the actual occurrences. The result would be a correlation to Hebrew dates that is off by x centuries, depending on when the expansion events did occur. In Part V daniel said that an expansion event was triggered by a well-thought-out positioning of the Moon. That was done before Adamu, which, of course, doesn't mean it couldn't have been done again. Question for this alternative is, why would the gods bother for a temporal alignment to the exact end of a Baktun? Bottom line is: we can't have our favored results (the correlations to Hebrew dates) if we don't calculate with finished or at least nearly-finished Baktuns.